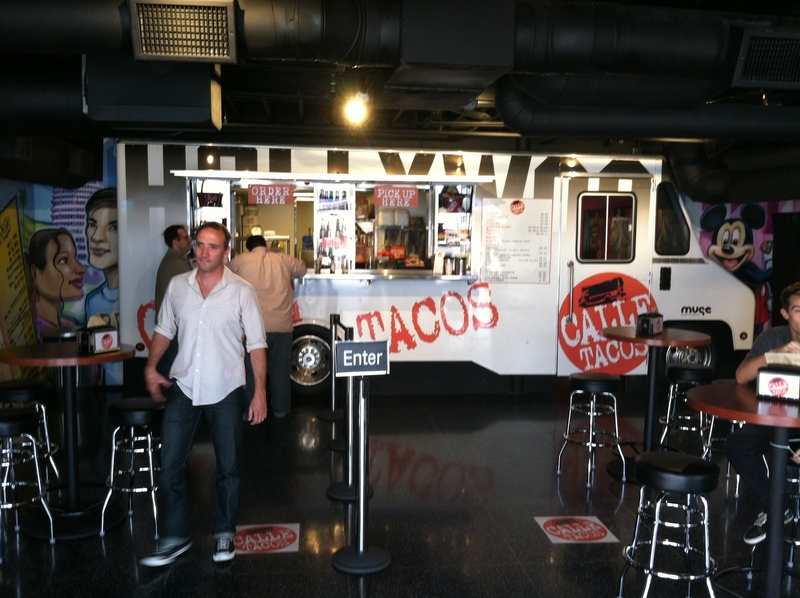 L.A. the Blog: Two New Eateries On Hollywood Blvd. As the machine development wheels forward unconquerable, implacable along the famous stretch of Hollywood Boulevard known as the Walk of Fame, where in golden stars immortalized forever rest the names of iconic people who bestowed years of entertainment upon us – L.A. the Blog is happy to announce two new eateries marking the mythic landscape. They totally make the “cheap eats” list of places to grab a quick bite and both are well worth the visit. The first place anyone from New York will recognize, and everyone else who watched Spider Man 2 the movie should remember fondly. The silver screen made-famous Joe’s Pizza where Toby McGuire playing Peter Parker worked delivering pizza in the film’s opening scenes – yes! 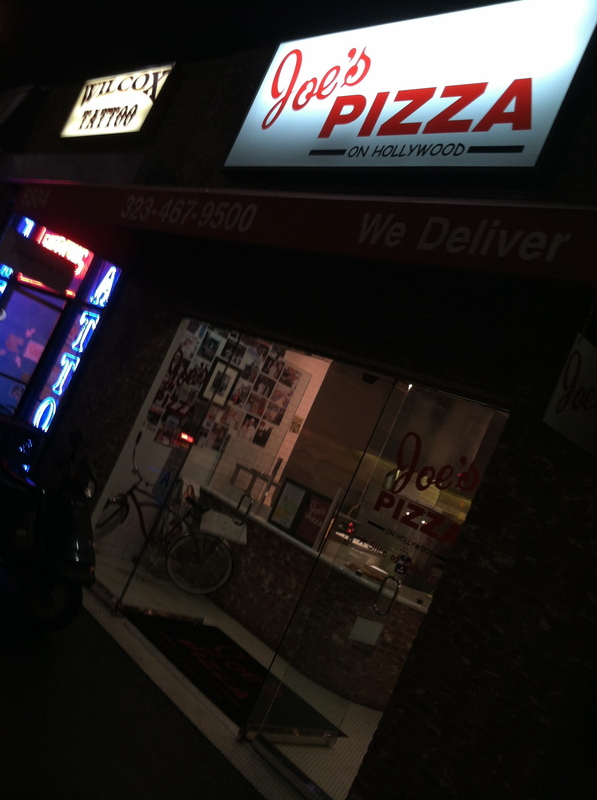 Joe’s Pizza is now gracing Hollywood right at Wilcox and Hollywood Blvd., and yes! Right around the corner of another New York staple Papaya King. We are experiencing a wholesale invasion from the east coast. Next will see Dunkin’ Donuts or something. As L.A. the Blog is personally very familiar with Joe’s pizza in New York our readers can trust us to safely critique the flavor of this new Joe’s in comparison to the one in NY. Surprisingly the pizza is very similar in taste, almost exactly the same in taste, so we give the place an A+ for its pizza. We will point out the slight differences. Whether it is the high-volume of pies that Joe’s in NYC throws out compared to this one, or that the cooks on the east coast have a process they are used too, the pizza at the Los Angeles location definitely was in better condition and looked as if they LA guys took time and tender loving care putting the pizza together. The crust was a little thicker, and in LA-fashion crispy too. Where Joe’s NYC is famous for fresh out of the oven pies, and a really thin crust that no one in their right mind would call crispy; the LA spot hasn’t reached the years of perfection in knocking down millimeters off the thickness and doesn’t do the volume to demand out-of-the-oven pizzas every five minutes. That we believe give the NY pies their distinct difference. Or as others believe it could be that the water in Los Angeles is different from the water in NYC. Yeah we use less chlorine maybe? As taste goes if you miss a slice of NYC, then head to Joe’s because it is damn close!!! The prices for a slice were around $2.50 so this place also makes our “cheap eats” list. The other spot that just opened is right next to Joe’s at Hollywood and Wilcox, and is a taco stand, err … truck, or restaurant, or a really awesome and creative eatery that serves up some good Mexican food. The Calle Taco truck, once a real food truck that graced the streets of Los Angeles now sits under an old Hollywood theater marquee near the intersection of Hollywood and Wilcox, slightly back from the sidewalk with tables and chairs in front, giving costumers a place to eat what the truck dishes up. Calle Tacos should get an award for best-designed restaurant on the boulevard. Not only did the place take a food truck, cut it in half, and place it on the inside of their restaurant so costumers have to order from the taco truck window, they also went all out in gracing the inside of the restaurant with beautiful graffiti murals of Los Angeles, and literally made the entrance to the bathrooms the front door to the food truck too. Why you ask? All in honor of the many taco / burrito dishing food trucks that everyday feed us on our merry ways through the city. Memorializing in true Hollywood fashion a staple of Los Angeles life and culture. L.A the Blog loves LA, so we love you Calle Tacos. The food was good, we didn’t try everything on the menu but the carne asade burrito tasted great. While not as cheep as a food truck with tacos at $1.95 and burritos at $5.95, you can definitely get some grub for under the $5, so it also makes the Blogs “cheap eats” list. Check out below for some picks of the place and when in Hollywood be sure to stop in! FYI – the graffiti is by LA-based artist Hex, aka Hector Rios. UPDATE: We just visited Calle Tacos again and noticed that Tuesday is $0.99 taco day, every Tuesday, and right now if you visit they have a free can of soda if you check in to their facebook page, or tweet about your visit. We scored a great lunch for $3.24! This entry was posted in Cheap Eats, culture, Food, Hollywood, L.A., LA, Los Angeles, LosAngeles, New York City and tagged burritos, Calle Taco, Cheap Eats, graffiti, Hollywood, hollywood blvd, hollywood boulevard, Joe's New York Pizza, L.A. the Blog, Los Angeles, Mexican food, pizza, restaurants, tacos, walk of fame. Bookmark the permalink.